Dr Eva Moreda Rodríguez is LKAS Research Fellow at the Music subject area. She specializes in the political and cultural history of Spanish music in the 20th century. By the time the Francoist army defeated the Republican troops and put an end to three years of Civil War in April 1939, more than four hundred thousand Spaniards had gone into exile. Artists and intellectuals were prominently represented among these, and music was no exception: of the eight composers grouped in the avant-garde Grupo de los Ocho in Madrid, five left Spain, as did other musicians and critics in their environment, such as Jesús Bal y Gay, Adolfo Salazar and Óscar Esplá. 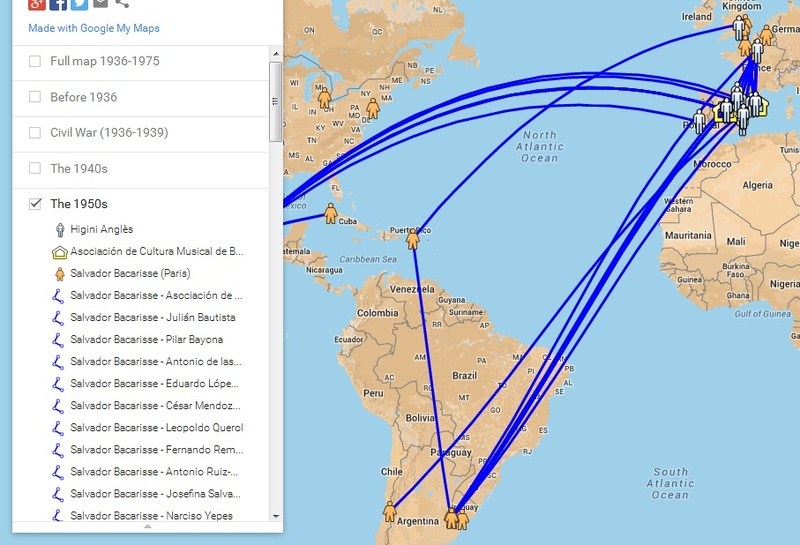 Musical life in Catalonia was similarly affected, with composers Jaume Pahissa, Roberto Gerhard and Baltasar Samper, cellist Pau Casals and soprano Conxita Badía, among others, settling abroad. Nevertheless, most exiled composers and musicians did not completely cut off their ties with Spain. Some of them corresponded extensively with their friends and family. 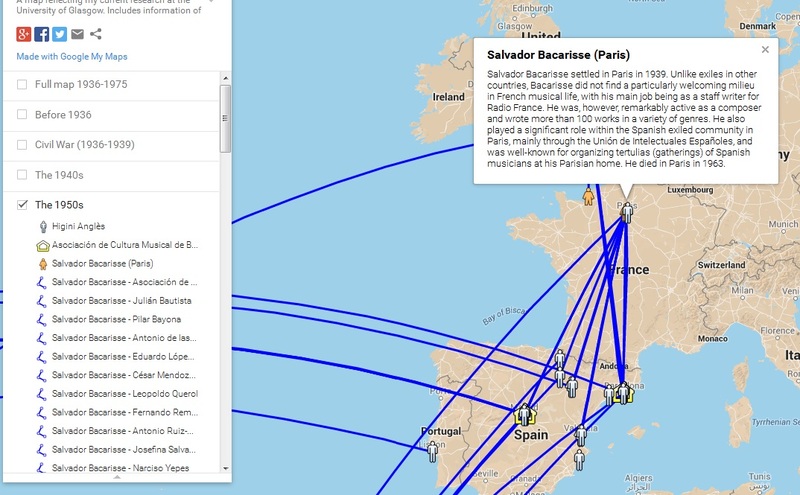 In some cases, such correspondence simply provided an outlet to discuss musical ideas or to express feelings about exile; in other cases, it resulted in opportunities for exiles to have their music performed or their research published in Spain. Other exiled composers had their music performed and celebrated in prominent state-sponsored festivals and events under Francoism. Spanish musicology has engaged to a considerable extent with exiled composers since at least the 1980s; nevertheless, I started to research in 2011 the contacts of exiled Spanish composers with people and institutions in Spain, it soon became obvious to me that the wealth and diversity of such contacts had not been properly explained thus far: most of the existing studies assumed that the exiles had been forgotten, neglected or even silenced in Francoist Spain, whereas those which acknowledged their presence claimed that the regime had appropriated them for reasons of cultural prestige. 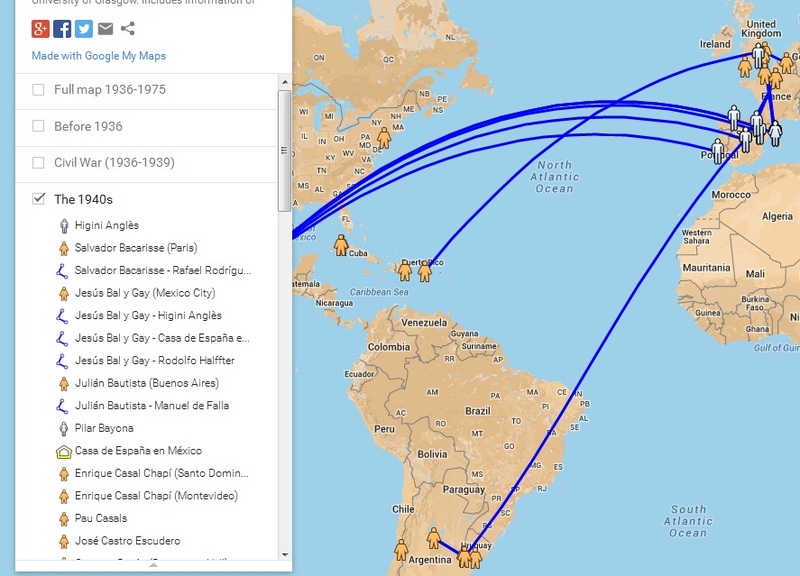 It was a desire to make sense of the evidence I had gathered in my trips to various archives that made me to come up with the idea of displaying my research findings into a map using Google Maps technologies: Spanish music in exile, 1939-1975. Research on the growing field of cultural mapping and, more generally, on the use of GIT (Geographical Information Technologies) in humanities research has emphasized that researcher- or user-generated maps can have an enormous empowering potential: they allow for diverse notions of space and place to be recorded and they can similarly help unpack the power relations and hierarchies that underlie cartography and map-making. As Spanish music in exile, 1939-1975 grew over the past years, I have certainly found this to be the case. The map has not only allowed me to visualize my research, but it has also encouraged me to advance my thinking about the subject and make use of creative strategies to make sense of trends and developments reflected on the map. One such example concerns the use of layers to represent different chronological periods in the span 1939-1975. If we compare the 1940s with the 1950s, we can certainly see that the latter shows a much richer network of connections between the exiles and the people and institutions in Spain. What can we make of this? What we see on the map certainly resonates with broadly held understandings of Francoism: most of the scholars of this period agree that, after a decade of extreme state violence and repression in the 1940s, the regime progressively liberalized. We can thus assume that in the 1950s many exiles felt sufficiently reassured to re-establish their ties with friends in Spain, have their music performed there or even return to Spain on a visit. Nevertheless, there are specific details and developments in the map that cannot be fully explained by broad references to the cultural context. 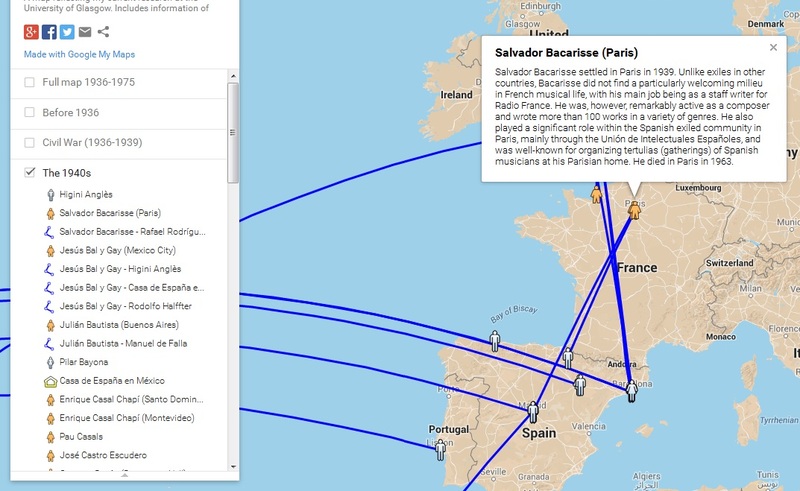 For example – why do connections between Spain and Paris increase so much, and why do all of these connections end on Salvador Bacarisse? Certainly, the liberalization of the 1950s made some performers feel more reassured to perform Bacarisse’s music in Spain. But such a wealth of contacts cannot be understood without taking into account Bacarisse’s own drive to take the music of the exiles back to Spain almost single-handedly. To this effect, he contacted several Spanish performers he had known in the 1920s and 1930s and who were still living in Spain; he also developed friendships with younger performers who had started their careers after the Spanish Civil War and send them the music he was composing in Paris. Most of such performers were amenable to Bacarisse’s suggestions, and throughout the 1950s he was probably the exiled composer to be most frequently performed in his native country. The map thus reminds us in a visual way that, in order to make sense of the Spanish Republican Exile, we need to develop context-sensitive interpretations which take the broader picture into account yet at the same time preserve the rich detail of each of the exiles’ experiences. This has been my first foray into cultural mapping or GIT more generally and I don’t think it will be the last – it has not only shaped my thinking about the subject at hand and about the individuals involved in it, but I have also found it a useful tool to share my research with others who I hope will be as fascinated by the detail of the exiles’ individual journeys as I am. The following website provides more information about the project, including instructions on how to use the map. María Luisa Mallo del Campo, Torner. Más allá del folklore (Oviedo, 1980), p. 15; Susana Asensio, Fuentes para el estudio de la música popular asturiana. A la memoria de Eduardo Martínez Torner (Madrid, 2010), p. 13; Susana Asensio, ‘Eduardo Martínez Torner y la Junta para Ampliación de Estudios en España’, Arbor 187:751 (2011), pp. 857-874; see p. 868; Javier Arias Bal, Jesús Bal y Gay (Lugo, 2003), p. 107; Jorge de Persia, Julián Bautista (Madrid, 2005), p. 2; Xavier Cester, Robert Gerhard i la importància de la seva contribució a la música (Manresa, 2000), p. 5; Julian White, ‘National Traditions in the Music of Roberto Gerhard’, Tempo, 184 (1993), pp. 2-13; see p. 2; Antonio Iglesias, Rodolfo Halffter. Su obra para piano (Madrid, 1979), p. 10; Christiane Heine, ‘Salvador Bacarisse (1898–1963) en el centenario de su nacimiento’, Cuadernos de música iberoamericana, 5 (1998), pp. 43-75; see p. 43; Xoán Manuel Carreira, ‘El extraño caso del dr. Bal y de mr. Gay’, in Xornadas sobre Bal y Gay (Santiago de Compostela, 2003), pp. 177-187. Chris Brennan-Horley, Susan Luckman, Chris Gibson and Julie Willoughby-Smith, ‘GIS, Ethnography, and Cultural Research: Putting Maps Back into Ethnographic Mapping’, The Information Society: An International Journal 26: 2 (2010), pp. 92-103; see p. 99; Chris Gibson, Chris Brennan-Horley and Andrew Warren , ‘Geographic Information Technologies for cultural research: cultural mapping and the prospects of colliding epistemologies’, Cultural Trends 19: 4 (2010), pp. 325-348; p. 330.